U.S. stocks extended their run to multi-year highs as investors clung to optimism generated by the Federal Reserve's plans to keep interest rates low and amid the continued flow of encouraging corporate earnings. The Teflon coated market largely looked past a lukewarm round of economic data headlined by a weaker Q1 GDP report and a surprising increase in jobless claims. The Dow Jones Industrial Average rose 72.35 points, or 0.6%, to 12763.31. The S&P 500 climbed 4.82 points, or 0.4%, to 1360.48. Sentiment was also boosted by strong earnings reports from Boeing, American Express, P&G, Dupont and better-than-expected march pending home sales, offsetting economic reports of lower 1Q GDP, rising weekly jobless claims and a weak Exxon result. The U.S. economy grew at a slower pace than forecasted in the first quarter as consumer purchases cooled, home construction fell and government spending declined. GDP rose at a 1.8% annual rate from January through March after a 3.1% pace in the last three months of 2010. Higher gas prices prompted Americans to limit spending after they ramped up purchases in the prior three months. To keep spurring the expansion, Federal Reserve policy makers said they’ll complete their US$600bn round of stimulus through June. The first-quarter pace was the slowest since April through June of last year. For all of 2010, the world’s largest economy expanded 2.9%, the most in five years, after shrinking 2.6% in 2009. Daily Dow Jones: Marching Towards Upper Channel Around 12800-13000 Zones. # The FOMC concluded that both the economic and labour market recovery is proceeding at a gradual and moderate pace. However, the FOMC acknowledged that the housing sector continues to be depressed. # The FOMC expected increases in energy and commodity prices to be transitory and anticipated a gradual return to higher levels of resource utilization in a context of price stability. # Consequently, the Fed will be maintaining its stimulus policy by completing QE2 by June and reinvesting the principal payments from its securities holdings. # The FOMC anticipated that the federal funds rate will remain at “low levels for an extended period”. # The FOMC statement is largely in line with the market and our expectations that the QE programme will be maintained. The FOMC did not even touch on the unwinding process, which lends support to our view that unwinding of QE will be delayed until early 2012.
v) Further appreciation can be expected for Asian currencies (MYR forecast for 2011: RM2.95-3.05/US$). # The main risk of FOMC prolonging its stimulus policy is that inflation-fighting exercise by Asian countries may tip the region’s economic growth. At this juncture, this risk is not yet elevated as the economic fundamentals of Asian countries remain sound while tightening is done at an incremental step. However, extended sharp rise in commodity prices may lead to over-tightening and choke economic growth. Wall Street outlook: Dow jumps further after Fed remarks. Despite a better-than-expected March durable goods report, the Dow traded cautiously in the morning session but leapt +96 points or 0.6% to 12691 after Bernanke said the Fed would continue to reinvest proceeds from maturing securities, adding that there was no specific time frame to tighten interest rates and pickup in inflation is likely temporary. The comments convinced investors that the Fed would keep its policy easing steady and interest rates accommodative. The Fed expects the economy to grow 3.1% to 3.3% in 2011 (Jan forecasts: 3.4% to 3.9%) and said it's more optimistic about jobs with the unemployment rate to fall to as low as 8.4% from 8.8% currently. Daily Dow Jones Is Marching Towards Upper Channel Around 12800 - 13000 Zones. Despite opening higher amid overnight Dow’s 0.9% gain, Asian markets ended mostly lower Wednesday, with investors’ mood shifting to caution ahead of the highly anticipated FOMC meeting, rising inflations, Standard & Poor’s warning on Japan’s debt and potential new round of tightening measures in China. Bucking the mixed regional markets and rising for the 3rd straight days, FBM KLCI inched up 2.6 pts on index-linked buying, as Ringgit appreciated further to 13-year high at RM2.978/US$. 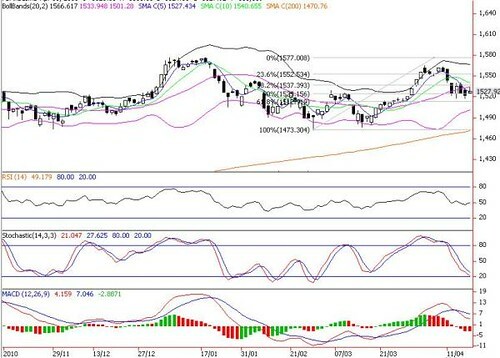 The FBM KLCI has been building its base above the 50-d SMA after reaching April’s high of 1565 pts. 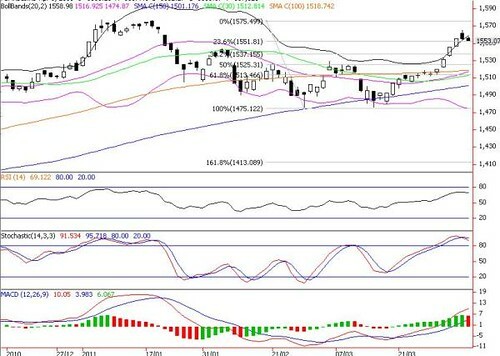 We expect FBM KLCI to react positively to the Fed statement and steady gains on Dow overnight, and is likely to retest higher resistance levels of 1537 (mid Bollinger band) and 1544 (23.6% FR). Further upside will depend on the economic outlook and monetary policy guidance from the forthcoming 5 May BNM monetary policy meeting. Support levels are 1515 (April’s low) and 1510 (lower Bollinger band). POS Malaysia price took a heavy beating to as low as RM3.23 (from 52-week high of RM3.74) on Monday following Khazanah’s divestmentof its 32.2% stake in Pos to DRBHicom for RM3.60/share last Friday. The fall could be attributable to investors’ disappointment that no general offer (GO) for the remaining shares in POS (below the 33% threshold), as well as awaiting further detailed business plans to unlock and liberalize the 16 plots of lands. Our institutional research remain positive on POS with a target price of RM3.80/share on the back of: (1) The pending relaxation of the 16 plots of identified land, which will further enhance Pos Malaysia’s value over the longer term; and (2) The synergistic effect between Pos Malaysia and DRB-Hicom. POS Malaysia is also likely to be supported by FY10’s netcash/share of RM0.66 and 17.5sen dividend/share (ex-date: 10 May). technical rebound wave. Cut loss below RM3.15. 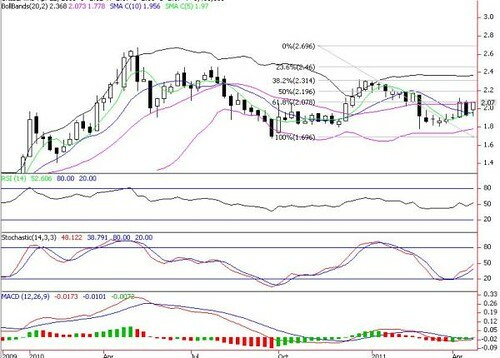 Further rebound targets are RM3.46 (38.2% FR), RM3.49 (mid Bollinger band – daily chart) and RM3.57 (23.6% FR). Immediate support levels are RM3.15-3.20. Daily POS Malaysia Chart Shows A Positive Close Today Is Required For A Bullish Reversal Trend. During the week, the Malaysian Government Securities (MGS) yield curve steepened as active trading was seen at the short-end and belly of the curve, supported by some foreign buying as ringgit appreciated by 0.6% week-on-week to close at a record low of RM3.0054/US$ on Friday. As a result, the 3-year benchmark MGS shed 4 basis points (bps) from the previous Friday to close at 3.31%. Meanwhile, yields on the 5- and 10-year MGS benchmarks rose 1bp and 4bps respectively to close at 3.57% and 4.11%. In contrast, the 7-year benchmark MGS remained stable at 3.79%. On Thursday, details of the new RM3.5 billion 10-year Government Investment Issue (GII) was announced by Bank Negara Malaysia (BNM), scheduled to be auctioned on 27 April 2011. The when-issue was dealt at a tight range of 4.19-4.22% on Thursday and Friday. On the economic front, Consumer Price Index (CPI) accelerated to 3.0% year-onyear in March 2011 from 2.9% in February 2011. The CPI continued to be mainly driven by high cost of food and beverages, as well as transport. For local private debt securities (PDS) market, trading was focused on AAA-rated papers, followed by AA-rated bonds which are mainly banking and power-related papers. On local macroeconomics, the economy should remain sustainable as domestic consumption and private investment are expected to continue to drive our economic growth. Meanwhile, there were renewed inflationary concerns in Malaysia with Consumer Price Index (CPI) numbers gradually climbing and after indication from central bank’s 2011 Annual Report being wary of greater inflationary pressure in the medium term. We expect inflationary concerns to persist, subject to further subsidy rationalization by the government. Following the slightly higher March CPI figure, players’ view on Overnight Policy Rate (OPR) are now split in their anticipation on whether Bank Negara will hike its benchmark OPR at next month’s Monetary Policy Committee (MPC) meeting. We reiterate our view that BNM will at most increase OPR by another 50-75bps from the current 2.75% this year, with likelihood of bringing the rate increase in 2Q11. For corporate bond market, we maintain our view that credit fundamentals in general should continue to improve with better cash flow and balance sheet positions in conjunction with economy recovery. While we expect to see more bond offers coming on stream in 2011 on the back of more infrastructure projects announcement by the government, the current supply of new issuance is showing otherwise. Unless and until we see influx of corporate bond issuance that warrant supply concerns, we expect the current demand for credit will be sufficient to support the new issuance due to pent up demand. The global market continues to be volatile in respond to the changing global problem and challenges. Investors were worried that the global uncertainty will prolong but at the same time hoping for higher return from riskier assets amid excess liquidity. On the local front, the equity market traded on more ambivalent sentiment. The FBM KLCI swung between gains and losses throughout the week in rather directionless trading. While we expect some firm buying after the ruling coalition retained its two-third majority in the Sarawak election, the market surprised us again as investors took the opportunity to sell on strength. Furthermore, corporate earnings released during the week were disappointing as companies on general are facing a squeeze in profit margin amid the rising commodity prices. For the week, the FBM KLCI rose 0.8 points or 0.05% to close at 1,522.75 points. The local equity market underperformed regional bourses massively as the MSCI Asia ex-Japan rose 2.1%. Average daily trading value declined 11% to RM1.55 billion, which was 22% below the three-month average of RM2.0 billion. The recent consolidation was within our expectation as we see limited upsides for the market in the short term. However, we remain bullish in the medium term as global/regional equity markets and commodities are expected to continue their respective rallies from March lows. We continue to favor construction, banking and property stocks. Wall Street outlook: Dow Jones reaches 3-year high on earnings boost. Strong earnings from IBM, 3M, Ford and UPS offset negative reports on Coca-cola and Feb’s home prices. The Fed press meeting is going to be the event of the day, offering both a fresh assessment of where the Fed sees the economy currently and an update on its plans to slowly exit from the extraordinarily easy policies since 2008. 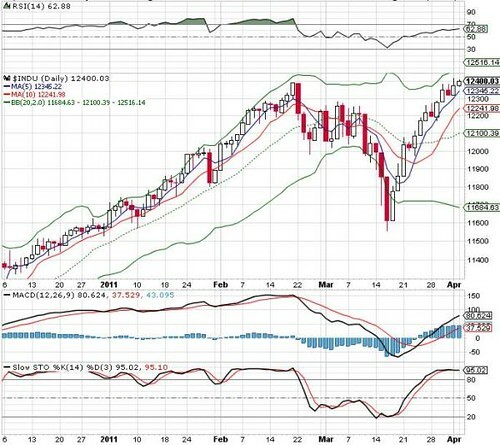 Daily Dow Jones Indicates Bulls Are Not Giving Up Yet As Index Cuts Above Upper Bollinger Band. Regional markets ended lower amid concerns over the impact of China’s aggressive policy tightening to curb inflation and ahead of the 26-27 April FOMC meeting. Despite negative regional markets, FBM KLCI rose 3.3 points, driven by last minute push on FBM 30 stocks as the Ringgit rose further to 13-year high at RM2.987/US$. Sentiment remained negative with losers beat gainers by 470 to 280 while daily volume was thin at 1.06 billion shares. FBM KLCI outlook: Awaiting more fresh leads to drive index higher. 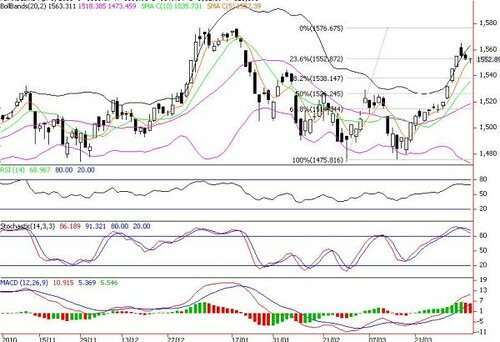 The FBM KLCI has been building its base above the lower Bollinger band (LBB) and hovering around 30-d SMA. Technically, this sideways consolidation trend is expected to continue for a while ahead of the outcome of FOMC meeting, May reporting season and 5 May MPC meeting. Longer term, we are positively biased, as once this consolidation ends, index should stage an attempt to break out from the 1537-1544 immediate resistance range and retest April’s high of 1565 points. Support levels are 1515 (April’s low) and 1510 (LBB). 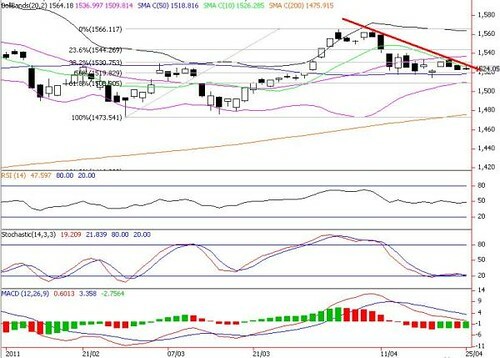 Daily KLCI Shows A Breakout Above The Down-Trend-LIne (DTL) Will Spur Index Higher To 1537-1544 Points. U.S. stocks fell as lower commodity prices drove down energy and raw-material producers. The S&P 500 slipped 0.2% to 1,335.25. The Dow Jones Industrial Average declined 26.11 points (0.2%) to 12,479.88. Purchases of new houses in the U.S. rose in March from a record low as the weakest industry in the economy strained to recover. New-home sales, tabulated when contracts are signed, climbed 11.1% to a 300,000 annual pace, faster than forecast. Housing prices fell from a year ago. The market for new homes faces competition from a glut of foreclosed properties that may keep prices depressed this year, discouraging new construction. The debt Fed press meeting is going to be the event of the week, offering both a fresh assessment of where the Fed sees the economy currently and an update on its plans to slowly exit from the extraordinarily easy policies since 2008. Major upcoming earnings release this week are 3M/Coca-cola/UPS (26 April), Boeing (27 April), Chevron/Microsoft/Exxon (28 April), Pepsico/P&G (29 April). 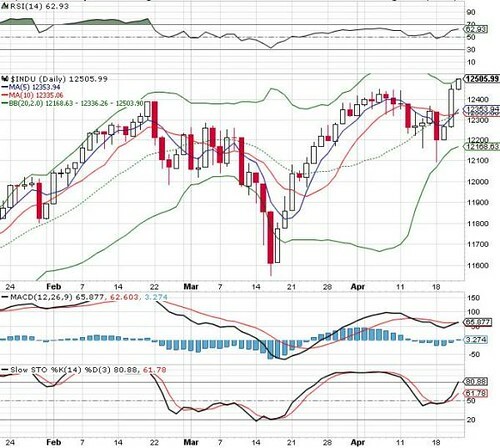 Daily DJIA Has More Cautious Trade With The Hanging Man Candlestick. Regional markets ended mixed in cautious trade amid concern over the impact of China’s aggressive policy tightening to curb inflation and before a slew of corporate earnings reports coupled with the closely watched 26-27 April FOMC meeting. Share prices on Bursa Malaysia traded on a tight trading range between the upside of 1,526.83 to lower end of 1522.99 (which about 4 points range). The FBM KLCI ended flat with a 1.3 points gain to 1524, spurred by index-linked stocks such as GENTING (+8sen to RM11.58), YTL (+17sen to RM7.99), PBBANK (+4sen to RM13.06), DIGI (+18sen to RM29.00) and IOICORP (+2sen to RM5.35). Market sentiment was cautious with losers leading gainers by 441 to 313, while daily volume and value were off 10% and 13% to 1.06 billion shares worth RM1.03 billion, respectively. Trading was lackluster after long weekend holiday of Good Friday. Investors still preferred to stay on the side line in the absence of fresh leads. Meanwhile, they are strong RM against the US dollar. Ringgit broke the psychological RM3 barrier to end at RM2.995/US$ for the first time in 13 years, as currency traders bet an interest rate hike is in the offing next month. Despite volatile external markets and expectations of OPR hike next month, the FBM KLCI has been consolidating well over the past few days, building its base above the lower Bollinger band and hovering near its 30-day and 50-day SMAs. Technically, we think this sideways consolidation trend will continue for a while longer ahead of the outcome of FOMC meeting, May reporting season and 5 May MPC meeting. Longer term, we are positively biased and expect prices to swing higher once this consolidation ends. 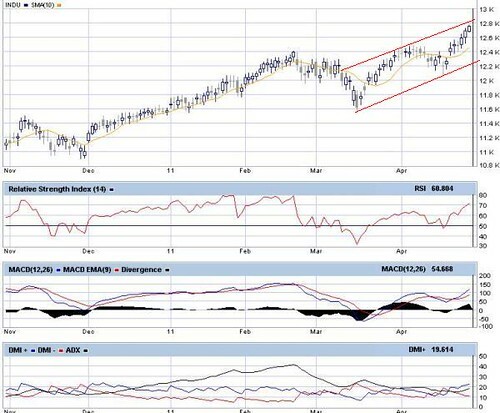 Technically, save for the daily slow Stochastics indicator which offers a slight hope of technical rebound upside this week, the renewed downtrend in MACD and RSI coupled with the close below short term downtrend line (DTL) could signal more sideways consolidation ahead. 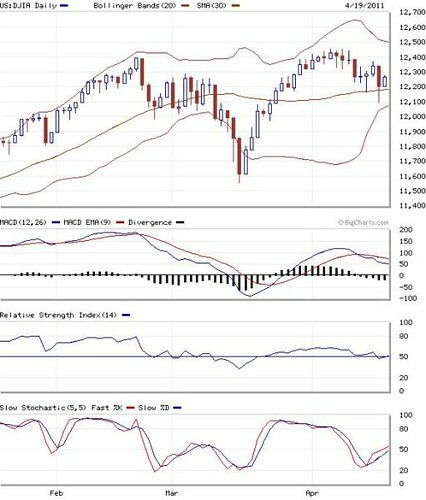 Support levels are 1518 (50-d SMA), 1508 (lower Bollinger band) and 1500 whilst upside resistance levels are 1530 (DTL), 1537 (mid Bollinger band) and 1544 (23.6% FR). Daily KLCI Having More Range Bound Consolidation Within 1510-1540 Band. Following S&P's lowering of its outlook on the US sovereign debt rating to "negative", what implications should investors be aware of? # S&P lowered its long-term US sovereign credit rating from “stable” to “negative”, while retaining its AAA rating on US sovereign debt. # A negative outlook is not equivalent to a downgrade. # Similar circumstances occurred in 1995-1996, where issues over the US budget led to a temporary government shutdown, and credit rating agencies lowered their outlook on the US sovereign debt rating. * Bond yields likely to rise. * The US dollar may weaken, and may become more volatile. * Heightened risk aversion may be expected, but is likely to be a temporary phenomenon; May provide a buying opportunity for risky assets. On 18 April 2011, Standard and Poor’s (S&P), one of the “big-three” credit rating agencies, affirmed its AAA (the highest possible) rating on long-term US sovereign debt, but lowered its outlook on the long-term US sovereign credit rating from “stable” to “negative”. According to S&P, this indicates that the US sovereign credit rating may be lowered over the next 6 to 24 months. As key negatives, S&P cited the “very large” budget deficit of the US along with “rising government indebtedness” as concerns, while the recent political gridlock over proposed government spending cuts to address budget challenges over the medium- to long-term has also given S&P some cause for worry. Amidst much fear mongering in the media over S&P’s latest move, we wish to highlight several important points. First, investors should note that S&P’s negative outlook is not equivalent to a downgrade. It merely represents a potential lowering of the US sovereign debt rating in the future (S&P continues to rate US sovereign debt as AAA), should current issues (namely the ongoing political gridlock over the US budget) fail to see resolution over the medium term. There is, of course, the possibility that US politicians may come to an amicable agreement to address longer-term budgetary concerns (which stands up to S&P’s scrutiny), thus allowing the US to avoid a rating downgrade. Second, while investors have generally been surprised by S&P’s latest announcement, this is not the first time a credit rating agency has lowered its outlook for US sovereign debt. Fitch Ratings had placed US sovereign debt on “negative ratings watch” in late 1995, while Moody’s Investor Services placed US$387 billion in Treasury bonds “on review for a possible downgrade” in January 1996. These negative outlooks also came as a result of political gridlock: Then-President Bill Clinton (a Democrat) and the Republican-led Congress were unable to come to a compromise over the budget, which led to a temporary government shutdown in November 1995. Third, it must be highlighted that even if the US sovereign debt rating were to be lowered, this would not be tantamount to a default. Should a downgrade be required, the US sovereign rating would likely fall by a notch to AA+ (from AAA), which, according to S&P’s rating system, still represents an entity which has a “very strong capacity to meet financial commitments”. A downgrade of the US sovereign rating would suggest upward pressure on bond yields, which is consistent with our view that bond yields are likely to rise in the future (see Why Bond Yields have been on the rise”). AAA-rated securities are perceived as having the lowest default risk, and as a result, provide the lowest returns (in the form of low yields). Should US sovereign debt be downgraded, investors may view the risk of default as having increased, and may demand higher yields on US government debt. In addition, rising sovereign bond yields have negative repercussions for other fixed income instruments, as their yields are measured in relation to sovereign yields. Admittedly, sovereign bond yields have not always fallen following a credit downgrade, with Japan’s credit downgrade in 2002 a case in point. In fact, following S&P’s negative outlook report, US government bond yields actually declined, a function of heightened risk aversion rather than investors pricing in a higher probability of default. Nevertheless, sovereign yields are already near historical lows following three decades of declining interest rates, and at this juncture, we think that there is more upside risk to interest rates. In this respect, we view developed sovereign bonds as most susceptible to rising yields, while emerging market debt and high yield bonds are likely to be less affected due to their higher relative yields. We continue to recommend investors to be positioned in short duration funds which are less susceptible to interest rate risk. Should a lower credit rating be attributed to US sovereign debt, the US dollar may see near-term weakness should more sellers than buyers of US debt emerge. A downgrade of the US sovereign debt rating may call into question the US dollar’s “reserve currency” status (should a credit downgrade occur, US debt may no longer be perceived as the safest option for building reserves), which may lead to a reduction of demand for USD-denominated instruments. In addition, since the US dollar is a fiat currency (not backed by a physical commodity), the US has the option of embarking on an inflationary path (by creating money and effectively monetising part of its debt) to reduce its debt burden, a move which would be negative for the US dollar. Currency movements are generally difficult to predict, and long-term fundamental reasoning (eg. interest rate parity) may often conflict with short-term capital flows. While there are various reasons (fiscal and current account deficit, quantitative easing) to sustain ongoing weakness in the US dollar, the USD has already depreciated against most Asian currencies over the past year, and market technicals may sometimes govern currency movements in the near-term, which has led to some industry experts calling for a rebound of the US dollar. We avoid speculating on short-term movements of the US dollar, but investors should be cautioned that further weakness may arise should a downgrade of the US sovereign debt rating occur. Investments in the fixed income space are particularly affected by currency movements, and we continue to urge investors to consider MYR-focused bond funds to avoid the potential foreign exchange losses. In addition, the uncertain interest rate environment coupled with increased concerns over the US sovereign debt rating suggests that global currency volatility is likely to remain high, which may provide currency funds with an increased opportunity set to generate returns. Investor risk aversion may increase if US sovereign debt gets downgraded, as the perceived risk-free rate is being called into question. Along with S&P’s downward revision of the US sovereign credit rating outlook, S&P also revised down the outlook for US government related entities, highlighting the unavoidable link between quasi-sovereign entities and the government. In the case of corporate entities, there is an element of contagion risk as few corporate credits are rated higher than sovereign debt, especially in the developed world. A downgrade of the US sovereign debt rating may hurt risky assets in the near term, but the stark difference between the US government and its corporate sector is worth a mention. While much has been made about the government’s inability to balance its budget (forecasts are for a US$1.267 trillion deficit for 2011), the US corporate sector remains extremely cash-rich with the Federal Reserve reporting that US non-farm non-financial corporate businesses held US$1.89 trillion of liquid assets at the end of 2010, the highest on record. 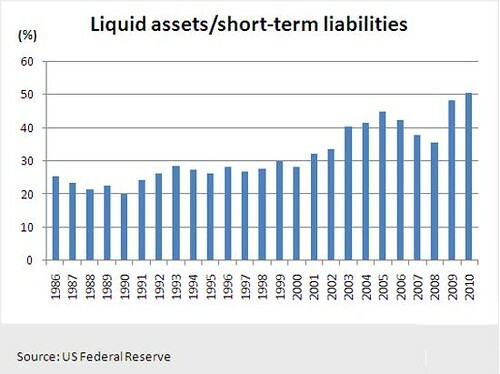 Liquid assets were 50.7% of short-term liabilities (see Chart 1), the highest level since 1986. In addition, corporate profitability continues to be strong, with 2011 S&P 500 earnings expected to be the highest on record. Given the difference in fundamentals, US equities still make sense from an investment standpoint. Stocks in the S&P 500 currently trade at relatively undemanding valuations (13.5X estimated 2011 earnings, as of 15 April 2011), and will become cheaper as earnings continue to grow over the next year. In addition, we do not expect the US to default on its debt, and any heightened risk aversion which is expected to arise from a downgrade will likely be a temporary phenomenon, and may provide a buying opportunity for risky assets like equities. # Sizeable landbank in strategic areas in Klang Valley, Penang and Johor. # Renewed focus on overseas expansion. # Benefitting from asset reflation. # Current share price is still below merger offer price. # Impending merger with Sunway Holdings. # Potential future Sunway REIT asset injections would unlock more free cash flow to grow land bank. # New MRT line to benefit Bandar Sunway Semenyih. 1) Slow sales for certain projects, such as Vivaldi. 2) Abortion of the merger. Large landbank, strong branding and market presence. Price target of RM5.10 is based on general offer price from Sunway Sdn Bhd, which is 29% below our RNAV estimate of RM7.15 per share. # KLK announced that it has disposed the remaining 40% stake in Barry Callebaut Malaysia (which is involved in the manufacturing of cocoa products) to Luijckx BV (a member of the Barry Callebaut group of companies) for RM117.7 milliion. # Recall in Mar 2008, KLK disposed a 60% stake in KLKepong Cocoa Products Sdn Bhd to Barry Callebaut group for RM153.6 million, and KL-Kepong Cocoa Products was subsequently changed name to Barry Callebaut Malaysia. # Management expects the disposal to complete by 3QFY09/11. Working backwards, we note that the disposal price is at a 14.9% premium the earlier disposal in 2008. Using the disposal gain of RM86.5 million (arising from the disposal of its earlier 60% stake) as a guide, we estimate that the latest disposal will result in a disposal gain of about RM54.8 million. Insignificant impact to KLK, as earnings contribution from Barry Callebaut Malaysia has been minimal. We are slightly positive on the latest development, as it allows KLK to free up its financial resources and streamline its non-core operations. FY09/11 net profit forecasts maintained for now, pending further update with management. In any case, we note that the latest disposal will not have immaterial impact to its recurring earnings apart from the disposal gain. Target Price remains unchanged at RM26.11 based on 18.5x CY2011 core EPS of 141.1 sen. Maintain BUY. The Dow jumped 1.3% wow to 12506 given that out of the 137 results release by S&P 500 companies, about 75% have beat earnings and sales estimates, according to Thomson Reuters. On top of focusing on the corporate earnings, Wall Street will tune in for Fed's inaugural press conference Wednesday afternoon, after the central bank's two-day FOMC meeting on 26-27 April. Major upcoming earnings release are 3M/Coca-cola/UPS (26 April), Boeing (27 April), Chevron/Microsoft/Exxon (28 April), Pepsico/P&G (29 April). Daily Dow Jones Industrial Average Is Upside Bias As Technicals On The Mend And 5-Days SMA Cut Above 10-Days SMA. Weekly DJIA Chart Shows Medium Term Upside Towards 13000 - 13500 Points. Last Friday, regional markets ended mixed with most closed for the Good Friday holiday amid concerns over the impact of China’s aggressive policy tightening amid rising inflation. The local bourse also extended its sideways consolidation with the FBM KLCI eased 3.6 points to 1522.8 amid concern of a possible hike in OPR as early as May when the BNM meets on 5 May following soaring inflation in February and March. The FBM KLCI jumped to as high as 1535 pts last week amid a relief rally post Sarawak election and strong overseas markets. Nevertheless, the momentum waned and index tumbled to as low as 1515 following the higher-than-expected March CPI report before ending flat at +0.1% week-on-week. 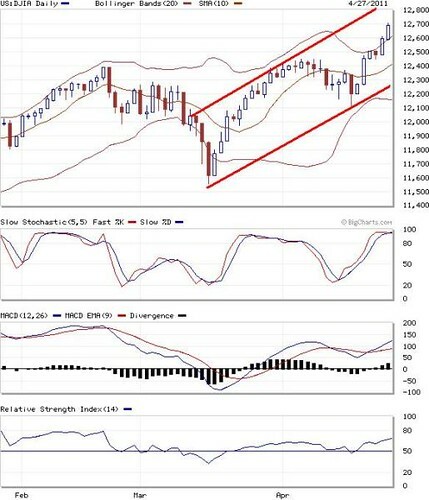 Technically, save for the daily slow Stochastics indicator which offers a slight hope of technical rebound upside this week, the renewed downtrend in MACD and RSI coupled with the close below short term downtrend line (DTL) as well as 5 and 10-day SMA lines could signal more sideways consolidation ahead. Support levels are 1513 (61.8% FR), 1508 (lower Bollinger band) and 1500 whilst upside resistance levels are 1530 (DTL), 1537 (38.2% FR) and 1552 (23.6% FR). FBM KLCI Is In Consolidation Again As Index Retraces Below The 5-Days, 10-Days SMAs And Downtrend Line. Despite weaker-than-expected weekly jobless claims and April Philly Fed data, the Dow continued its rally to the highest since June 2008, as strong corporate earnings boosted confidence in the U.S. economy. U.S. stocks rose as stronger-than-estimated earnings bolstered optimism about the economy. The Dow Jones Industrial Average rose 52.45 points, or 0.4% (+1.3% wow) to 12,505.99, as corporate earnings by Travelers, Apple, Morgan Stanley and Qualcomm topped estimates. The S&P 500 gained 0.5% to 1,337.38. New applications for unemployment benefits in the U.S. fell less than forecast last week, indicating the labor market will take time to improve. Jobless claims decreased by 13,000 to 403,000 in the week ended April 16. The number of people on unemployment benefit rolls and those receiving extended payments declined. Daily Dow Jones Is Upside Bias As Technicals On The Mend And 5-Days SMA Cut Above The 10-Days SMA. IOICORP tumbled from 2011’s high of RM6.16 on 4 January to as low as RM5.29 on 18 April, mainly due to the suspension of Roundtable of Sustainable Palm Oil (RSPO) certification amid disputes over land issues, endangered wildlife habitat and illegal deforestation in Sarawak, raising reputational risk. 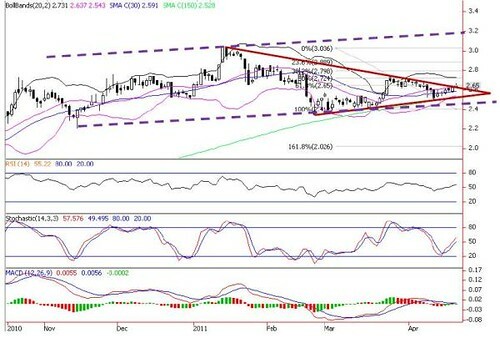 The fall below the uptrend line (UTL: RM5.60) and 200-d SMA (RM5.55) suggest that the bears are gaining momentum. Although IOICORP rebounded from RM5.29 to close at RM5.40 yesterday on abating selling pressures and bottoming up of technical indicators, near term outlook remains uninspiring. Further rebound will likely be capped at RM5.55 and RM5.80 (38.2% FR). Meanwhile, support levels are situated around RM5.20 (61.8% FR) and RM5.00. Unload on strength. attached a target price of RM3.50. AIRASIA broke out of its triangle descending wedge yesterday. Near term outlook has turned brighter as AIRASIA managed to close above the 30-d SMA (RM2.59) and mid Bollinger band (RM2.63). Technical landscape remains compelling. 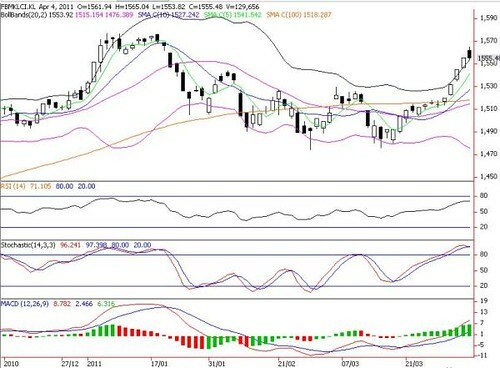 MACD is on the verge of staging a golden cross while the slow Stochastics and RSI are trending upwards. 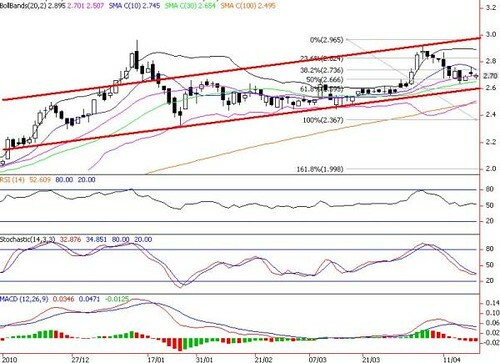 Immediate resistance levels are RM2.73 (upper Bollinger band) and RM2.80 (38.2% FR). Further upside targets are 52-week high of RM3.04 and RM3.20 (upper boundary of upward channel formation). 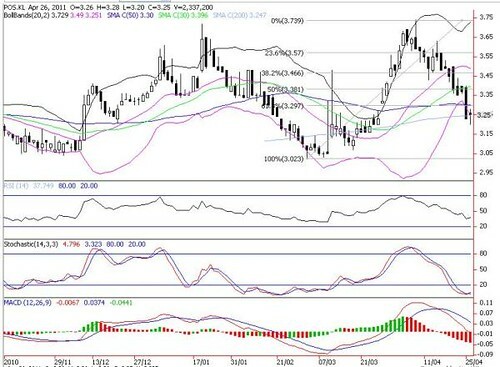 Support levels are situated around RM2.59 and RM2.54 (lower Bollinger band). Accumulate but put a stop at below RM2.54. For leveraging, investors can also consider AIRASIA-CL (expires on 8 December 11), which is trading at a discount of 11.7% with a high gearing of 5.8x. 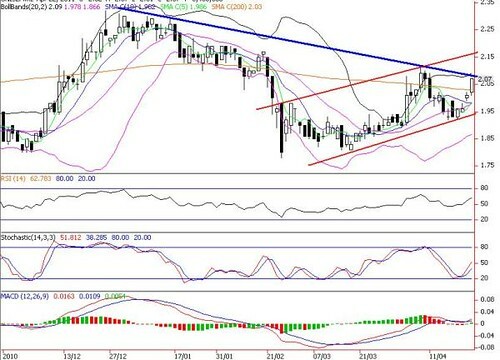 AirAsia Poised To Rise Higher After A Triangle Breakout. The FBM KLCI jumped 9.5 pts or 0.6% to close at intraday high of 1530.1 points, in line with solid gains on regional markets, sparked by overnight rally on Dow amid strong corporate earnings and housing data. Gainers led losers by 473 to 288 while daily volume and value soared 22% and 30% to 1.29bn shares worth RM1.81 billion, respectively. FBM KLCI outlook: Looking bullish again on strong overseas markets. 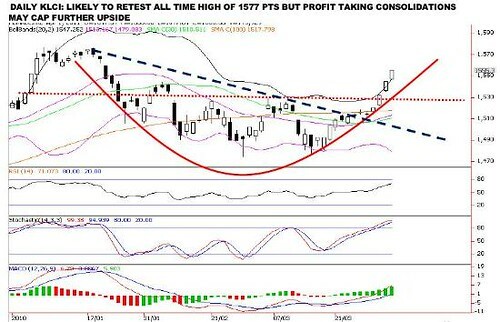 expect the KLCI to revisit historical high of 1577 points. 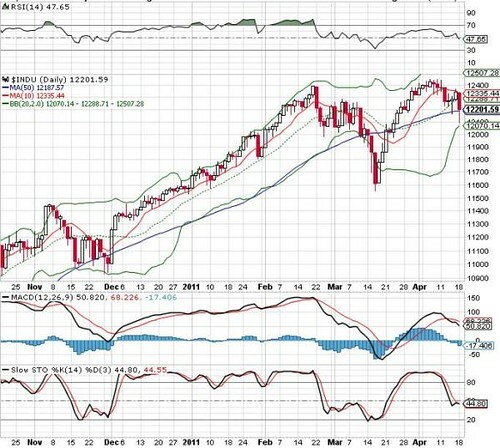 Technical readings have also improved as RSI, MACD and slow Stochastics are hooking up again. Major support levels are 1525 (50% FR), 1513 (61.8% FR) and 1500. 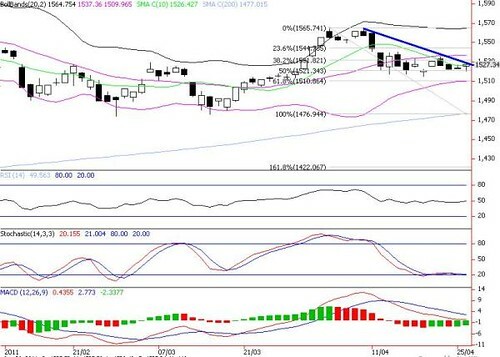 Daily KLCI Shows Signs Of Strong Turn Around Amid Rising 5-Days SMA, Slow Stochastics And MACD. Kencana will continue to be one of the key beneficiaries of upcoming contract awards given its (i) proven track records with Petronas and other oil majors, and (ii) status as a Petronas-licensee to fabricate offshore O&G structures. Recent pullback from 52-week high of RM2.96 (13 January) dragged prices to RM2.33 (26 January) but the bulls were quick to intercept as share price consolidated higher to close at RM2.70 yesterday. Meanwhile, the close above RM2.65 (10-d SMA) suggests that a recovery is taking place slowly. A swing above RM2.75 (10-d SMA) would increase the odds for the bulls. 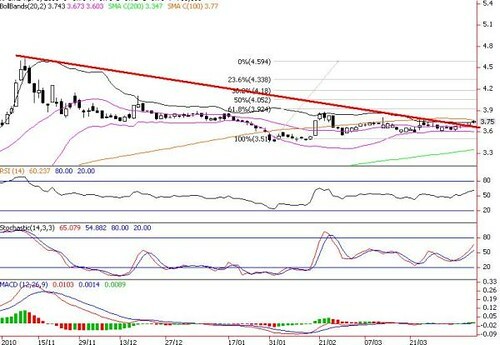 Further upside targets are RM2.83 (23.8% FR) and RM2.95. Thereafter, it should move towards the upper channel of RM3.00. Support levels are RM2.65 and RM2.60 (61.8% FR). 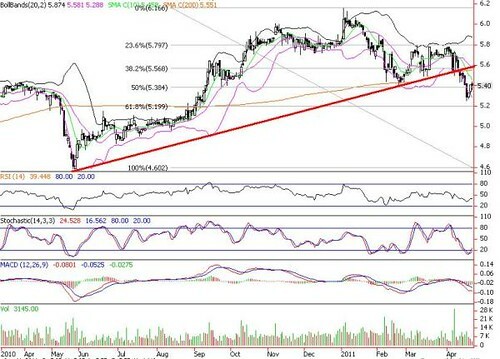 Cut loss if price falls below uptrend line support of RM2.60. For leveraging, investors can also consider Kencana-CD (expires on 14 September 11), which is trading at a discount of 2.2% with a decent gearing of 2.4x. Kencana Is Poised To Head Towards RM3.00 After A Brief Consolidation. The FBM KLCI gapped down 7.7 points and slumped as much as 13 points in the morning session following a plunge on Dow last Friday. However, it managed to pare down some of the losses to end at 6.4 points lower at 1521.5, boosted by the announcement of 12 ETP projects with RM11.16 billion in investments. Market breadth was negative with 295 gainers as compared to 455 losers. In the wake of a resilient close by Wall Street overnight, the FBM KLCI may attempt to fill the 7.7-point gap-down formed yesterday. However, further rally to retest April’s high of 1565 points looks slim as trading volume is thin amid cautious sentiment, affected by external developments i.e. global economic growth, 1Q earnings season in U.S., rising oil prices and interest rates, Japan’s earthquake and nuclear crisis and the re-emergence of Europe’s debt crisis. Moreover the FBM KLCI is still below its 10-day SMA and mid Bollinger band. Upside resistance levels are 1534 (mid Bollinger band), 1537(10d- SMA) and 1552 (23.6% FR) whilst major support levels are situated around 1513 (61.8% FR) and 1500. Daily FBM KLCI Has More Consolidations As KLCI Index Is Still Below The 10-Days SMA And Mid Bollinger Band. The FBM KLCI surged as much as 11 points intraday following BN’s 2/3 majority win in the Sarawak election. 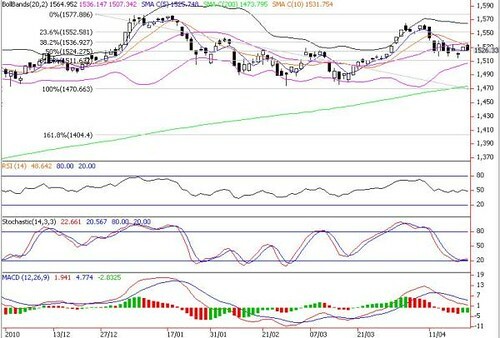 However, the gains were pared down to 6 points at 1527.9 amid weak regional markets. Regional markets mostly retreated on renewed nervousness ahead of quarterly earnings results and lingering worries about indebted euro zone countries. Sentiment was also affected by concerns over more monetary policy tightening in China and key emerging countries which could potentially derailed the economic growth. Post Sarawak election, investors’ attention are likely to shift back to other topics, including global economic outlook, 1Q earnings season in U.S., rising oil prices and interest rates, Japan’s earthquake and nuclear crisis and the re-emergence of Europe’s debt crisis. The overnight Dow’s fall could take a toll on Bursa Malaysia today. However, this should be cushioned by expectations that the government is likely to capitalize on the results in Sarawak by expediting diligent roll out and implementation of various construction projects and government land deals under ETP as well as reforms newsflow. 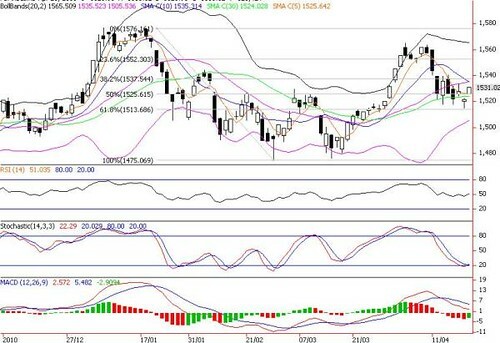 Upside resistance levels are 1537 (38.2% FR), 1540 (10-d SMA) and 1552 (23.6% FR) whilst major support levels are situated around 1517 (last week’s low), 1513 (61.8% FR) and 1500. FBM KLCI Is Taking Further Consolidations As Index Still Unable To Break Above 10-Days SMA And Mid Bollinger Band. Despite better-than-expected Citigroup’s earnings, the Dow sank as much as 248 points intraday after S&P cut its outlook on U.S. government debt to negative, saying the political stalemate in Washington could threaten the nation's AAA credit rating. However, the losses were trimmed to 140 points (close at 12201) as bargain-hunters emerged. After the bell, Texas reported lower-than-expected 1Q2011 results and trimmed its outlook. Major earnings release scheduled in this holiday-shortened week (closed 22 April on Good Friday) are Citigroup/Texas (18 April) and Yahoo/Intel/IBM/Goldman Sachs (19 April). 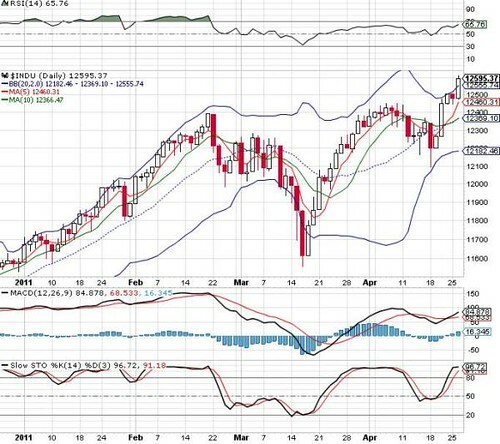 Following the breakdown of major supports of 12272 (5-d SMA), 12335 (10-d SMA) and 12288 (mid Bollinger band), near term Dow’s outlook has turned unfavourable. Momentum and trend indicators are also flashing negative signals. Key results and economic announcements for the rest of the week are Yahoo/Intel/IBM/Goldman Sachs/March housing starts (19 April), March existing home sales (April 20), March leading indicators and weekly jobless claims (April 21). 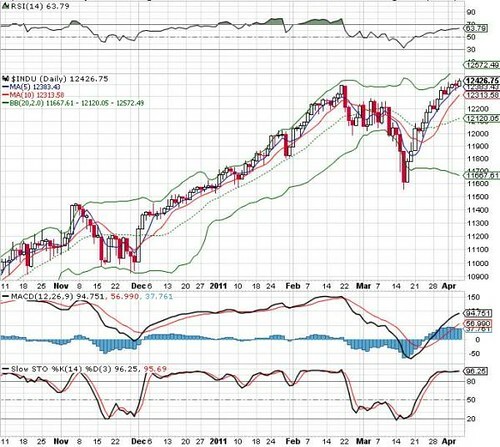 Major support levels are situated around 12093 (50-d SMA) and 12000 whilst upside targets are 12335 and 12507 (daily upper Bollinger band). 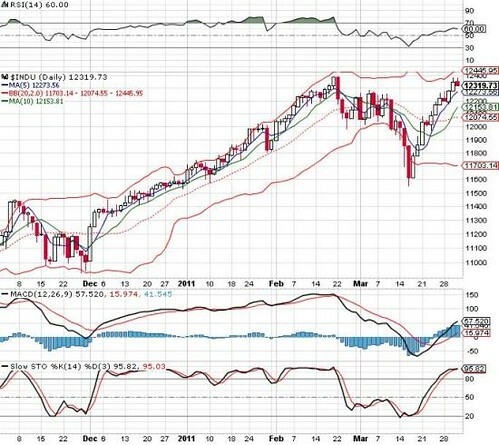 Daily Dow Jones Has More Downward Consolidation As The 10-Days SMA And Mid Bollinger Band Are Broken. U.S. Federal Reserve Chairman Ben Bernanke said policy makers must watch inflation “extremely closely” for evidence that rising commodity costs are having more than a temporary impact on consumer prices. According to Bernanke, so long as inflation expectations remain stable and well anchored and the rise in commodity prices slows as he’s forecasting, then the increase in inflation will be transitory. U.S. Congress leaders and President Barack Obama agreed to cut about US$38 billion from federal spending this year while jettisoning Republican proposals to defund Planned Parenthood and block environmental rules, pulling the government back from the brink of a shutdown. Ireland’s credit rating was cut one level by Standard & Poor’s and put on watch for a possible downgrade by Fitch Ratings after the cost of rescuing Irish banks reached as much as EUR100 billion (US$141.5 billion). S&P lowered the rating to BBB+ from A-, putting the country on the same level as Thailand and the Bahamas. However, S&P commented that the outlook remains stable. On the other hand, Fitch placed its long-term foreign and local-currency issuer default ratings of BBB+ on negative, "indicating a heightened probability of a downgrade in the near term. Asian economies can afford to remove fiscal and monetary stimulus at a “stronger and faster” rate as growth in the region outpaces the rest of the world, the World Bank said. Capital inflows are still a “danger” and policy makers can adopt targeted and temporary controls if needed, Sri Mulyani Indrawati, a World Bank managing director, said. Buying was seen particularly focussed on the short-tenured, both benchmark and off-the-run during the week. Consequently, the Malaysian Government Securities (MGS) yield curve bullish steepened as the 3-year benchmark Malaysian Government Securities (MGS) yield fell 12 basis points (bps) WoW to close at 3.35%, while the 10-year fell 2bps to 4.09%. The MGS market was also likely to be supported by foreign buying with the ringgit appreciating by 0.4% WoW to close at a record low of RM3.0165/US$, on 8 April 2011. Meanwhile, the 5-year and 7-year fell by 2bps and 3bps respectively to 3.62% and 3.82%. On economic front, exports for February 2011 surprisingly grew by 10.69% year-on-year (YoY) from 3.0% in January 2011, while imports sustained double-digit growth as it rose by 11.5% YoY. The export surge was largely contributed by higher demand from China and Hong Kong as well as Japan during the month. However, on a month-on-month basis, exports and imports contracted by 5.5% and 12.6% respectively due to the short working month for Chinese New Year holidays in February. For local private debt securities (PDS) market, trading was dominated by AA-rated papers, which are largely bank subordinated debts and followed by AAA-rated bonds. Meanwhile, the PDS credit outlook was dampened by a massive 8 negative rating actions. The focus was on the 7 Selangor water concessionaires, which the water bonds were downgraded by Malaysian Rating Corporation (MARC), pending unresolved restructuring in negotiations between the Selangor government, Federal Government and the water concessionaires which heighten default risks. Meanwhile, there was a downgrade on a brick manufacturing company which defaulted on profit payment . On local macroeconomics, we have started to see some slowdown in economy but it should remain sustainable as domestic consumption and private investment are still expected to drive our economic growth. Meanwhile, inflationary fears for most emerging countries are seen tapering off. However, for Malaysia, there were renewed inflationary concerns with the latest Consumer Price Index (CPI) number surprising consensus and after indication from central bank’s 2011 Annual Report being wary of greater inflationary pressure in the medium term. We expect continual inflationary concerns on the back of further subsidy rationalization by the government. Following the last hawkish Monetary Policy Committee (MPC) statement and coupled with the higher-than-expected CPI data for February, many economists view the MPC statement as a signal that central bank may resume rate normalization in the next upcoming MPC meeting in May. We reiterate our view that BNM will at most increase OPR by another 50-75bps from the current 2.75% this year, with likelihood of bringing the rate increase in 2Q11. Meanwhile, foreign holdings in MGS and short-term Bills remained high. This offers some confidence to the market that current sentiment remains supportive of ringgit assets. However, suspicion over potential reversal of capital flows are likely to constantly cloud the market sentiment. On the above backdrop, we expect local MGS market to remain volatile. For corporate bond market however, we maintain our view that credit market will be supported in conjunction with economy recovery. We expect companies to continue to report improvement in balance sheets and cash flow positions going forward. While we expect to see more bond offers coming on stream in 2011 on the back of more infrastructure projects announcement by the government, the current supply of new issuances is showing otherwise. Unless and until we see influx of corporate bond issuances that warrant supply concerns, we expect the current demand for credit will be sufficient to support the new issuances due to pent up demand. Last but not least, rising risk appetite in tandem with positive credit outlook should continue to encourage investors to move down the credit curve in search for value . Regional markets ended higher last week as rising M&As and improving U.S. economy bolstered optimism of a sustainable global economic recovery. Sentiment was also boosted as Japan pledged support for businesses hit by the Mar 11 earthquake and made progress stabilizing the nuclear power plant. 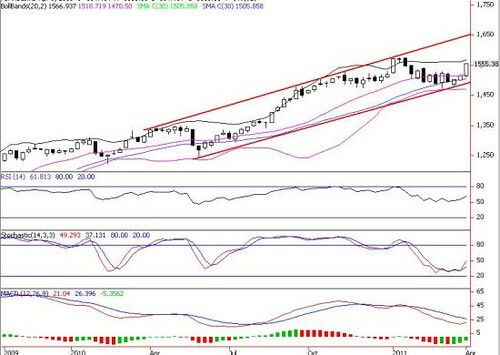 The FBM KLCI was down 4.4 points last Friday as the euphoria on April 12-13 Invest Malaysia (IM) subsided after peaking at intraweek high of 1565 points. However, it managed to end marginally higher wow by 2 points to record its 4th straight weekly gains. 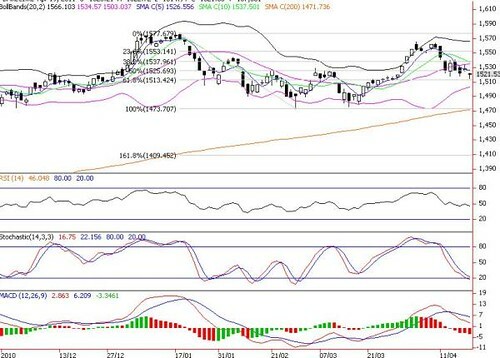 The index could rise higher to retest all time high of 1577 points this week, given the positive expectations from the IM conference, which could showcase ETP progress and new initiatives, as well as new mega listings to attract foreign funds to Malaysia. 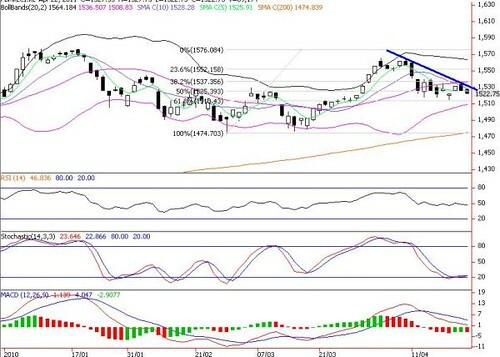 Nevertheless, profit taking consolidations could come in later part of the week amid overbought technical readings and ahead of the Apr 16 Sarawak election. Immediate resistance remains at 1,565 (last week’s high), followed by all time high of 1577 points and 1600 psychological barrier. Immediate support levels are situated around 1552 (23.6% FR), 1544 (10-d SMA) and 1538 (38.2% FR). FBM KLCI Will Has More Profit Taking Consolidations If 5-Days And 10-Days SMAs Are Broken. KFC’s 396.5 million bonus and 31.7 million warrants (1 for 25 after share split and bonus) were listed in September 10, after completing the share split (1 into 2) and bonus issue (1 for 1). The stock peaked at 52-wk high in November 10 amid speculation that US private equity fund was looking to buy out the company (denied by KFC). Since then, KFC corrected to as low as RM3.46 in February 11 before staging a positive breakout above the downtrend line to RM3.75 last Friday. Accumulate as we expect more appreciation ahead, given that technical readings are on the mend. Immediate upside targets are RM3.92 (61.8% FR), RM4.05 (50% FR) and RM4.18 (38.2% FR). Major support levels are RM3.67 (mid Bollinger band) and RM3.60 (lower Bollinger band). Put a stop below RM3.60. Alternatively, one may look at KFC-CA due to its high gearing and KFC-WB due to its long maturity date. KFC Daily Chart: Poised To Retest RM4.00-RM4.20 Zones Amid Positive Breakout And Improving Technicals. (3) The injection of Iselin (which acquired a 33.3% stake in South Beach Consortium, SBC) into Scottsdale in consideration of a shareholder loan owing by Scottsdale to IOI Consolidated. # Both CDL and IOI may be required to contribute, in proportion of their respective shareholdings in Scottsdale, estimated to be in the region of S$500 million each. # All in, the acquisitions will involve a total investment cost of up to S$816.8 million (equivalent to RM1.96 billion) by IOI. and (3) Tax rate of 25%. in SBC) is at a 6.9% discount to the S$155 million that CDL paid for Istithmar’s 33.33% stake. Despite the strategic location and it is likely the last major iconic site in the Civic District, we are neutral on the latest development, given the huge investment cost involved in the project (including a potential equity injection of S$500 million, or RM1.2 billion) and the Singaporean government’s measure to cool its property sector, which may in turn affect demand and hence the pricing of this development. (3) The suspension of RSPO certification may give rise to reputation risk. FY06/11 net profit forecasts maintained for now. Recent suspension of RSPO certification may give rise to reputational risk. (1) Strong earnings outlook, given our bullish view on CPO prices and demand; and (2) Strong balance sheet. SOP-derived TP (see Figure 3) remains unchanged (based on SOP) at RM5.90, pending further update with management. # All its 21.38 sen final dividend may be elected under the dividend reinvestment plan (DRP). Issue price of the DRP will be at RM7.56 or 10% discount to ex-dividend VWAP. # EPF (RHB Cap’s major shareholder)’s CEO denied any merger discussion but said that it is open to such move if it brings good value to shareholders. Newswire reported that ADCB appointed Goldman Sachs Group and Merrill Lynch & Co as advisors for the stake sale. Assuming all shareholders elect to accept the dividend in shares, its FY11 EPS would be diluted by about 2% while ROE will decline by circa 30bps. The latter will reduce our target price from RM9.49 to RM9.30. However, both its Tier-1 and RWCAR capital ratios for FY11 would be boosted by circa 39bps. Shareholders will benefit as the dividend reinvestment plan (DRP) shares are priced at 12% discount to yesterday’s closing price. Despite dilution to EPS and ROE (as well as our target price), it will ensure robust capital base and flexibility in rewarding shareholders with higher payout then its official dividend policy of 30%. This dividend reinvestment plan (DRP) will provide additional yield pick-up of 0.26% if investors opted for the DRP rather than the all cash option. Short-term share overhang as investors may sell ahead of new shares allotment to lock in profits. However, this should be mitigated by M&A excitement as well as ADCB’s intention to sell its 25% stake. We suspect ADCB is likely to sell its stake entirely to another strategic partner at premium to market price given that it will fetch a better pricing while current price is still valuing RHB Cap as one of the “cheapest” bank in Malaysia despite ROE that is comparable to industry average. A new strategic partner could add more value vis-à-vis- ADCB which has largely been passive since its entry. Unexpected jump in impaired loans and lower than expected loan growth as well as impact from Basel III. ROE at industry average but valuations among the lowest (see Figure 1) vs. larger peers; Transformation bearing fruits, reflected in strong loan growth and improving asset quality; “Easy” contributing to higher market share in retail segment; and potential of the tie-up with Pos Malaysia. Target price unchanged at RM9.49 based on Gordon Growth with ROE of 15.2% and WACC of 9.3%. The Dow Jones rallied almost hit a three-year high, as Tech gains overshadowed concern that a budget impasse in Congress will shut down the government that may happen as soon as this weekend. Financial stocks led gains, +1.1%, there were reports portfolio managers who were underweight in Q1 were unwinding their bet. Energy stocks came under pressure after the government's weekly inventory report showed smaller-than-expected declines in U.S. supplies of oil and gasoline, raising fears that energy demand is waning. The Dow Jones Industrial Average closed up 32.85 pts, or 0.27%, to 12426.75. The S&P 500-stock index tacked on 0.1% to 1333. Despite negative concerns of Portugal’s bailout request from the EU and Congress risks a federal government shutdown if it fails to approve a spending bill by Friday. Cisco triggered a technology rally on speculation the maker of networking equipment will sell or spin off its consumer business. 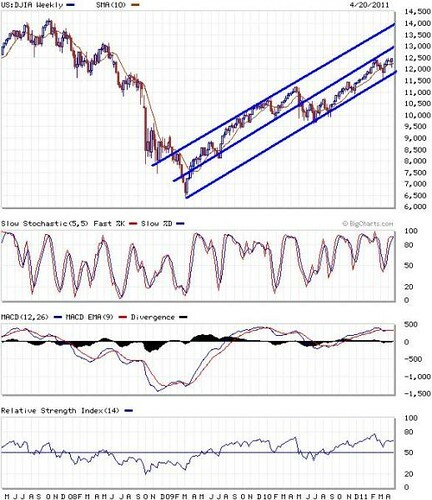 Dow Jones Is Likely To Consolidate soon Owing To Overbought Indicators. Share prices on Bursa Malaysia closed marginal lower on mild profit-taking in selected blue chips. Market breadth remained strong with gainers outpacing losers 1.58:1.However, investors were still concern on the growing inflationary pressures as well as the renewed Portugal debt problem. At close, the FBM KLCI shed 0.18 of a point to 1,552.89. Gainers led losers by 490 to 310 while volume was 1.57bn shares (-2%) valued at RM2.07bn (+5%). We reiterate our near term positive view on the FBM KLCI after last week's breakout rally and positive domestic newsflows. Blue chips are expected to consolidate further till overbought conditions neutralize, while sustained rotational plays and lower liners continue to attract retail participation. Immediate resistance remains at 1,565 (last week’s high), followed by all time high of 1577 points. Support levels are situated around 1525 (50% FR) and 1538 (38.2% FR). Daily KLCI: A Breakdown Below 5-Days SMA Will Trigger More Selling Pressures. In line with mixed regional markets, the FBM KLCI fell 2.4 points to 1553.1, snapping its 5-day winning streak, amidst concern of more rates hike by the developed countries and China to clamp on rising inflation. Investors were also concerned on the report that Tokyo Electric Power Co has begun dumping radioactive water. Trading volume decreased to 1.6 billion shares worth RM1.97 billion against Monday's 1.69 billion shares worth RM2.24 billion. Yesterday, the People’s Bank of China announced a hike in 1-year lending rate by 25bps (the 4th since Oct 10) to 6.31% before the market reopens today after a 3-day holiday. 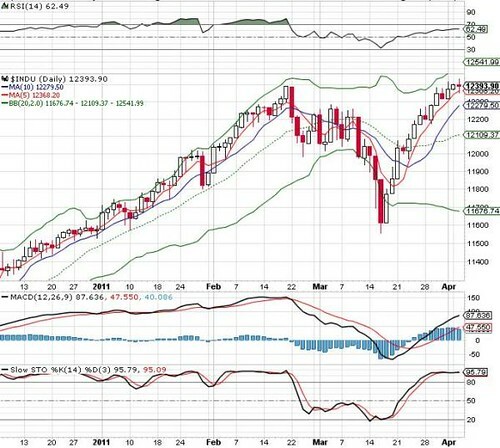 However, the index should pause for profit-taking given the overbought signals, as well as taking clues from overseas markets following more hawkish tome from the Fed and China’s 4th rates hike since Oct 10 yesterday. Immediate resistance levels are 1565-1577 whilst support levels are situated around 1525-1537. FBM KLCI Has More Profit Taking Consolidations Amid Weakening Technicals. U.S. stocks ended flat in a light day of trading as market focused on Fed's minutes which saw Fed maintaining easy-money policies while offering reassuring words about the economy and vigilance on inflation, and a weak March non-ISM data of 57.3 (consensus: 59). The Dow Jones Industrial Average closed down 6.20 points to 12393.83. The S&P 500 index shed 0.2% or .24 to 1332.63. U.S. Federal Reserve Chairman Ben S. Bernanke said policy makers must watch inflation “extremely closely” for evidence that rising commodity costs are having more than a temporary impact on consumer prices. “So long as inflation expectations remain stable and well anchored” and the rise in commodity prices slows, as he’s forecasting, then “the increase in inflation will be transitory,” Bernanke said. The Dow lost as much as 46 points intraday, following most world markets, after China raised key lending rate and the rating agency Moody's lowered Portugal's credit rating. Daily Dow Jones Industrial Average: Signs Of Moderation. MGS/Government Investment Issue (GII) supply scheduled in 2Q11. On a week-on-week basis, 5- and 10-year MGS climbed 5 basis points (bps) higher to 3.65% and 4.11% respectively, whilst 3-year MGS rose 7bps to 3.47% and 7-year MGS jumped 9bps higher to 3.84%. Meanwhile, the RM4.0 billion auction of the new 3.5-year GII drew weak demand with a bid-to-offer ratio of 1.43x (average yield of 3.505%), compared with the year to-date average of 2.29x, and the most recent 3-year GII auction in September 2010, which drew 2.5x bid-to-offer ratio. The broader money supply, M3, slowed down to 7.9% year-on-year (YoY) in February, after rebounding strongly by 8.8% in January, pointing to slower but resilient economic growth. Similarly, loan growth eased to 12.2% YoY in February (13.1% in January), mainly due to a weaker growth in corporate as well as household loans during the month. For local private debt securities (PDS) market, trading interest remains focused on AAA-rated/ Government-guaranteed (GG) papers, followed by AA-rated papers. Following the last hawkish Monetary Policy Committee (MPC) statement and coupled with the higher-than-expected CPI data for February, many economists view the MPC statement as a signal that central bank may resume rate normalization in the next upcoming MPC meeting in May. We reiterate our view that Bank Negara Malaysia (BNM) will at most increase Overnight Policy Rate (OPR) by another 50-75bps from the current 2.75% this year, with likelihood of bringing the rate increase in 2Q11. On supply and demand dynamics, market has generally expected a larger issuance size for government bonds for 2011. We think the unanticipated influx of GG papers and issuance size of the Private Placement for government bonds may present new supply pressure and influence direction of the bond yields. Nonetheless, ample liquidity in the market may continue to lend support to the new supplies. For corporate bond market however, we maintain our view that credit market will be supported in conjunction with economy recovery. We expect companies to continue to report improvement in balance sheets and cash flow positions going forward. While we expect to see more bond offers coming on stream in 2011 on the back of more infrastructure projects announcement by the government, the current supply of new issuance is showing otherwise. Unless and until we see influx of corporate bond issuance that warrant supply concerns, we expect the current demand for credit will be sufficient to support the new issuance due to pent up demand. Last but not least, rising risk appetite in tandem with positive credit outlook should continue to encourage investors to move down the credit curve in search for value. It was a good week for Malaysia equities as the key benchmark index surged 39.8 points or 2.6% to close at 1,555.3 points. Investors’ sentiment turned bullish with signs of real participation from the local and foreign houses. The buying was broad-based with strong volume. However, the FBM KLCI underperformed the region for the week as the MSCI Asia Ex-Japan rally 3.3%. On the broader market, the FBM EMAS index jumped 269.7 points or 2.58% to 10,686.6 points while the FBM Small Cap index up 418.7 points or 3.29% to 13,116 points. Average daily trading value rose 15% to RM2.25 billion, which was 1% above the three-month average of RM2.23 billion. expect more positive news will be announced during the upcoming Invest Malaysia event. We see 1,528 as the support level. We continue to like construction, property and oil & gas. U.S. stocks wavered in light volume, as investors debated the outlook for U.S. monetary policy and eyed the impact of rising prices for oil and other commodities, before ISM non-manufacturing data and Fed FOMC minutes release today. Sentiment was also cautious ahead of the 1Q2011 reporting season next week. The Dow Jones Industrial Average closed up 23.31 pts or 0.19% to 12400.03. The S&P 500-stock index closed up a fraction at 1332.87. On corporate front, chips shares rose after hours as Texas said it could acquire National Semiconductor for US$6.5 billion or US$25/share but Nasdaq ended flat during normal hours after the SIA said February sales fell 1.1% mom. Daily DJIA: Short Term Uptrend Still Intact Unless Falling Below The 5-Days SMA. MMCCORP is a good proxy for the upcoming election play, given its exposure to various infrastructure developments under the ETP, positive anticipation of the KL MRT and listing of Gas Malaysia. Based on Bloomberg estimates, MMCORP is slated to record a 26% CAGR from FY10-13 amid the maiden contribution as project manager of the MRT project. The energy division may be potentially catalysed by contract win, should they win the second 1,000MW coalfired power plant in Tanjung Bin. After peaking at 2011’s high of RM3.22 on 10 January, MMCCORP corrected to as low as RM2.57 on 15 March. 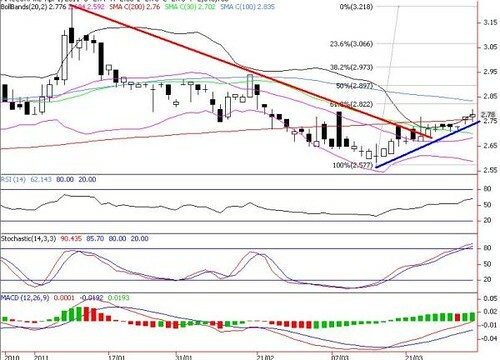 However, it staged a decisive breakout above the descending wedge resistance and the 200-d SMA (RM2.76) to end at RM2.78 last Friday. 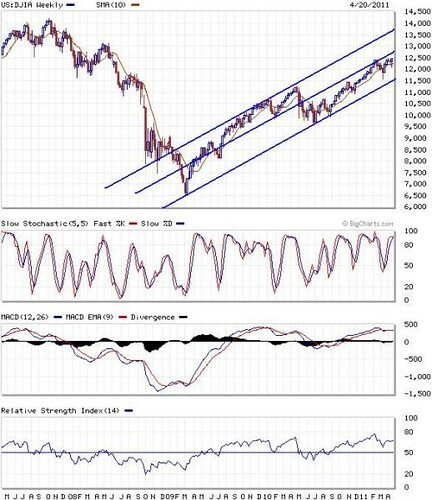 Short term uptrend remains firm, given that both RSI and MACD are expanding its uptrend and gaining momentum. 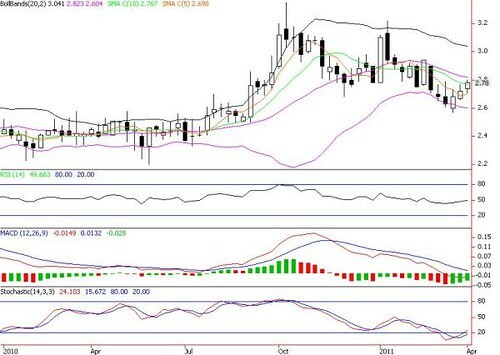 Accumulate as we expect prices to swing towards the RM2.83 (100-d SMA), RM2.89 (50% FR) and RM2.97 (38.2% FR). The next target is RM3.22. Major support levels are RM2.70 and RM2.68 (mid Bollinger band) and RM2.65. Remember to put a stop below RM2.65. 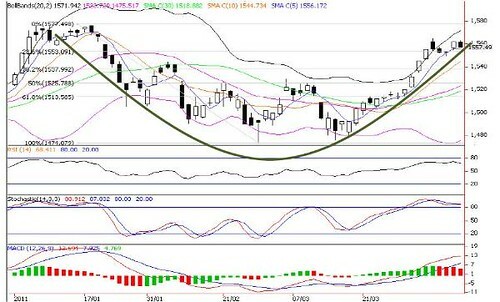 MMCCORP Daily Chart Indicates Investors Might Have To Sell Into Rally Amid Overbought Technical Readings. MMCCORP Weekly Poised To Retest Upper Bollinger Band On Bullish Technicals. FBM KLCI up 10.3 points last Friday to end the week 2.6% higher at 1555.4, driven by active interests in selected blue chips. Market breadth was bullish with 517 gainers against 319 losers, backed by fresh domestic leads. PM has given the assurance that the government will announce a slew of new major and exciting projects in the next few months, providing traction in implementing effectively ETP. Besides, government’s plans to slowly remove subsidy cuts to spur consumption and cap inflation aided market sentiment. Despite black swan events such as Japan’s earthquake & nuclear crisis, surging oil prices and Euro debt crisis that will make the 2Q more volatile, there is still upside bias for the market to move higher, spurred mainly by the local catalysts. Weekly FBM KLCI Upside Target Of 1650 Points Is In The Medium Term. Wall Street Recap: Dow Jones down 31 points ahead of the crucial job data. U.S. stocks struggled to add to the best first quarter this century as investors absorbed humdrum economic data and looked ahead to the government's March jobs report on Friday. Late comments from Federal Reserve Bank of Minneapolis President Narayana Kocherlakota that the fed funds rate may need to rise in late 2011 - and perhaps by as much as 75bps - lit a flame under bond yields and saw selling hit equities in the final quarter hour. The Dow Jones Industrial Average dropped 30.88 points, or 0.25%, to 12319.73 (+0.8% month-on-month; +6.4% quarter-on-quarter) on profit taking ahead of the crucial job data tonight and Fed officials remark that key interest rates might have to rise in late 2011. The S&P 500 eased 2.43 points, or 0.2%, to 1325.83. Sentiment was cautious on reports that Irish regulators instructed four banks to raise US$34bn in additional capital following a stress test on the nation’s lenders coupled with Portugal’s high budget deficit of 8.6% (consensus: 7%). Economic data was mixed as weekly jobless claims fell 6k to 388k but Feb factory orders dropped 0.1% against consensus +0.5%. Oil prices also settled at a two-and-a-half-year high, rising 2.4% near US$107/barrel. Daily Dow Jones Short Term Uptrend Still Intact Unless Falling Below The 5-Days SMA.